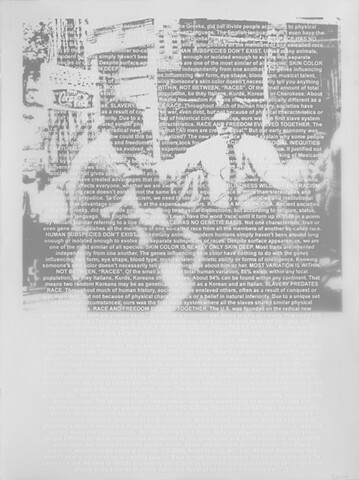 Printed on paper is a photo of Walter Gadsden being attacked by police and dogs during 1963 civil rights protests in Birmingham, AL. Photograph in pubic domain by Bill Hudson. Printed on vellum is "Ten Things Everyone Should Know About Race" from the PBS series, "Race: the Power of an Illusion".